I’ve been playing with grain-free cracker recipes this week. It’s nice once in a while to have something crispy and crunchy to eat. 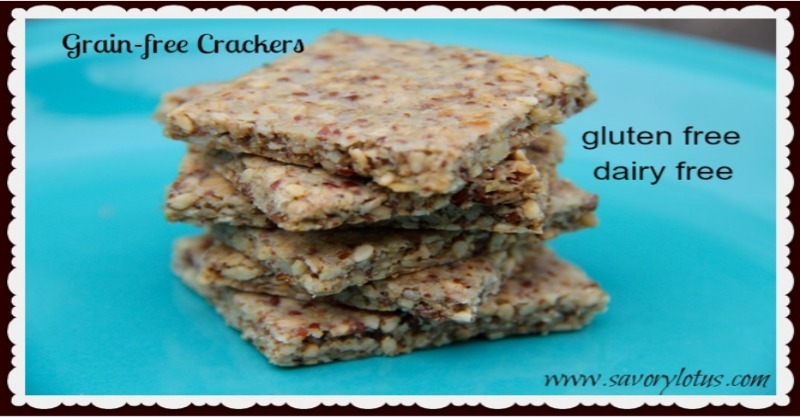 And I think that I have found the perfect grain free cracker recipe. And I think that you are going to love it! This recipe is dairy and egg-free. And I used coconut oil as the fat. Many of the nuts and seeds that I used were soaked and dehydrated to make crispy nuts. This makes them more digestible. The grain free cracker recipe has a titch of almond flour as the base, but I added a ton of other things as well. I have made this recipe with both hazelnuts and macadamia nuts, and both were super yummy. The macadamia ones were a bit lighter and flakier, which was nice. 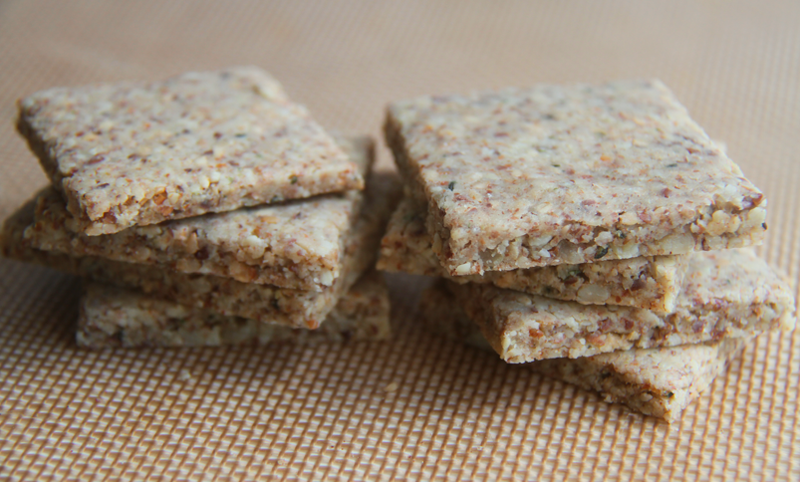 Do you love grain free crackers? 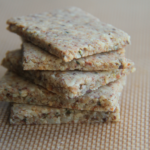 Check out my nut free Paleo Crackers as well. Gluten and nut free! That is perfect for my house. Mom is allergic to nuts and tree nuts, as well as gluten. I have Celiac Disease and am allergic to peanuts. I will have to try these someday. Thanks for stopping by. The recipe is super versatile. Just added pumpkin seeds and hemp seeds to this recipe and they turned out great. These look great! I am allergic to flax, is there a substitute? Maybe chia seed or additional hemp seed? This recipe is super versatile. Just leave out the flax. Replace it with 2 TBS hemp seeds and 2 TBS pumpkin seeds. Chia would work great too. I vary mine all of the time. Let me know how it works out. I just found a link to your website on FB, and LOVE IT! What wonderful recipes. Regarding the two recipes above for GF crackers. I cannot have Almonds or sesame seeds. What would suggest as a replacement for the almond flour and sesame seeds? Thank you and I can’t wait to try some more of these recipes! You can make the “Just Seeds” crackers with sunflower seeds. Just leave out the sesame seeds and add whatever seeds you can have. I love pumpkin seeds in these crackers. You can do hemp, chia, flax, etc. These crackers are super versatile. Just make sure the “dough” is slightly sticky and you will have no problems rolling it out. If you can do macadamia nuts, they are awesome in these crackers. I have had this page bookmarked for a while now and I refer to it for the “Just Seeds” cracker recipe. Today it isn’t to be found. I can only find the “Grain-free Everything” recipe on your site. Can the “Just Seeds” be reposted or sent to my email address please? I have some munchkins that can’t have nuts, but seem to be okay with the sesame and sunflower seed recipe. Hi, can you make these without a dehydrator? YES! I only use the dehydrator to dehydrate my nuts and seeds after soaking them. You don’t have to do that step. You can use raw nuts and seeds. I just do it to make them more digestible.